It’s hard for a situation comedy to change its situation. The loft is the contrivance that introduced Jessica Day to Schmidt, Winston, Coach, and Nick. As Erik Adams points out in his review of the fifth season finale, “the loft is the most tangible connection between these people,” and the intimacy and immediacy of their close quarters fuels the show. But a makeshift living situation can only stay static for so long. Now is a perfect time to strip the show’s dynamics down to the studs. Winston’s eager to nurture his relationship while Aly’s away on an FBI training course, whether that means ending their frequent Skype sessions with long goodbye songs or setting up her ditzy sister Leslie (Ayden Mayeri) as Schmidt and Cece’s real estate agent. Nick returns from New Orleans a month early, not because things went badly, but because they went well. He’s committed to a long-distance romance with Reagan, and he’s finally finished his first novel. Everyone’s moving forward but Jess. Trying to get past her feelings for Nick (“that old turkey burger”), she spent the summer throwing herself into one project after another: urban corn harvest, learning Portuguese, getting “scary ripped,” and now the noisy art of woodworking. (Oh, I’m sorry, “woodturning.” It’s a tidy metaphor that the “infernal racket” of Jess’ false progress interrupts her roommates’ actual progress.) When Leslie proves she’s not much of a real estate agent, Jess makes Schmidt and Cece’s house hunt her next project. She’s trying to move forward by staying put, inserting herself into her friends’ marriage. When an angry homeowner scares off the group from the house Cece and Schmidt thought they’d bought, they scatter, and Jess heads the wrong way. That little sight gag sets up the whole story. But even though everyone else is moving forward, Jess isn’t the only one heading in the wrong direction. Trying to keep Jess’ secret, Cece traps herself between her best friend and her husband, managing both Jess’ misplaced enthusiasm and Schmidt’s mounting frustration. Eager to embrace the friend he’s missed all summer, Nick unwittingly sends Jess skittering off. Everyone in “House Hunt” moves forward, but no one does it alone. Nick trusts Schmidt and Cece enough to co-sign for their loan, and his trust is returned when they buy a cheaper house rather than risk losing the bar. 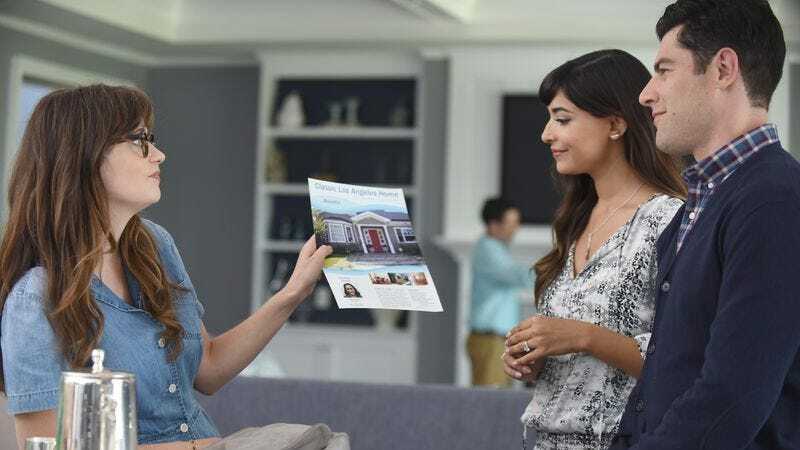 Jess’ vision and energy, so annoying during the house hunt, becomes invaluable when Cece and Schmidt invest in a fixer-upper—the scary, sad “no-ghost” fixer-upper Jess found for them. Winston trusts Aly enough to tell her Leslie’s a fool, and Aly trusts him to be honest even when his news is unwelcome. Nick dedicates his novel to Jess because she’s the one who—whatever the cost to herself—encouraged him to take a chance on himself. To trust himself. Nick trusts Winston with a gator tooth… but this is the last one. Let’s go back to the mid-point of this episode, and the beginning of this review. Just before Jess confesses her feelings for Nick, Schmidt tells her they need to meet new people. But they meet new people all the time. The whole show hinges on the idea that new people can become indispensable to each other. New Girl has a long history of introducing new people, new situations, and new configurations of longstanding relationships with giddy ease. After this episode, there’s every reason to think it will handle a new home, a new location, and (eventually) a split focal point for its action with the same grace. Zooey Deschanel credits “House Hunt” with “setting the emotional tone for the season,” and it does that by shaking up its fundamentals: the shared home, the will-they-won’t-they. The loft made these romances and friendships possible by bringing everyone together. But when New Girl strips itself down to its studs, it’s not about an apartment any more than “House Hunt” is about a house. And sometimes, when you tear apart the old structure, you find something beautiful underneath. Zooey Deschanel directed the premiere, and it’s fascinating to me that this episode shows Jessica Day at her least perky and polka-dotty. She spends most of “House Hunt” frantic and distracted, her famously wide eyes glazed, hectic spots of color in her cheeks. For a split second, I was afraid Cece and Schmidt would buy that ritzy new house and need housemates to help pay the mortgage, moving the ensemble to a luxuriously bland setting, but ”House Hunt” sidestepped that pitfall. Phew. “A dumped-out sewing kit” might be the most Winston thing Winston’s ever said: unexpected, but cozily domestic and impeccably vivid. Thanks to Erik Adams for handing over the lease on New Girl reviews to me, and for his many years of coverage! I’ll make sure we get our security deposit back, Erik.